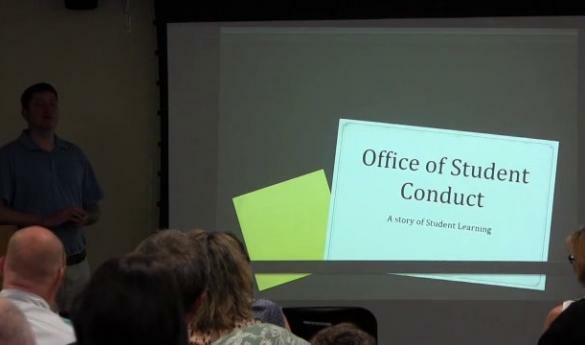 Mason's current code of conduct does not allow students have a lawyer represent them during conduct hearings, that could change with a new legislation in the General Assembly (photo courtesy of Office of Student Conduct). According to Mason’s current student code of conduct, students are not allowed to have a lawyer represent them during hearings with representatives from the Office of Student Conduct. According to university officials, Mason’s disciplinary process is designed to be more of an educational process than a legal proceeding. “Our goal is to meet with students and to figure out what an educational response is to a poor decision,” said Brent Ericson, director of Mason’s Office of Student Conduct. A proposed bill in the Virginia General Assembly could change that system to make certain student conduct hearings look more like court proceedings. “This bill is to give students a voice in expulsion and suspension hearings and a right to due process which every parent should be concerned about,” said the bill’s patron, Delegate Rick Morris. While the bill only applies to incidences where students could be suspended or expelled, Ericson believes the change would have an adverse effect on the relationship between students and the university. Proponents of the bill say that is exactly what should happen when there are serious allegations brought against students who do not have a right to legally represent themselves. Supporters argue that students who are being charged with assault or other serious offense should be given a chance in due process, since they are likely to carry the charges throughout their career. Ericson is also concerned that allowing students to hire lawyers would discourage students from reporting incidences if they were not under the privacy of a conduct hearing. “A lot of times students will opt to go through our process rather than a criminal one,” Ericson said. Likewise, Ericson believes students would be at a disadvantage if they brought charges against another student who could afford a lawyer. According to Ericson, there have already been 13 cases this semester that would qualify for students to have a lawyer present. Mason’s General Council are not involved in the hearing process with students, but play an advising role to the Office of Student Conduct. The bill is scheduled for the Virginia House Higher Education Subcommittee on Tuesday, February 4. January 31, 2014: Correction: The original article stated that "according to Mason’s current student code of conduct, students are not allowed to have a lawyer present during hearings with representatives from the Office of Student Conduct." That is incorrect. Students are allowed to have a lawyer or advisor present, but they may not engage in the discussion. We regret the error.